Bring your life more convenience and your computer more space! 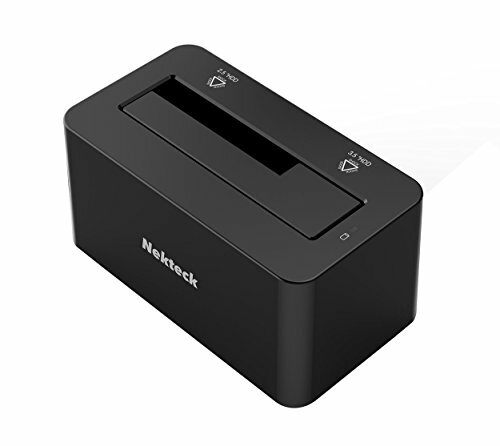 Nekteck USB Type C to A External Hard Drive Docking Station does it all for you. The latest and most advanced USB C connector allows you to transfer data with super speed without worrying about plugging it upside down. It supports all standard 2.5-inch or 3.5-inch SATA-I, SATA-II, SATA-III HDD SDD up to maximum capacity. You can use multiple hard drives with your computer without having to reboot. Plus, itís so simple to use ñ just plug and play. No screw and driver needed. The tool-free installation lets you install and unmount within 3 seconds at ease. Just pop your hard drive into the dock, plug it in your computer and youíre good to go! Support all standard 2.5'' or 3.5'' SATA-I, SATA-II, SATA-III HDD SSD drives up to any capacity. Screwless and tool-free design; No driver needed: Tool-free installation allows users to install and unmount within 3 seconds at ease. By Athena Computer Power Corp.